Apple pie may be the flavor that comes to mind in conjunction with the phrase "all-American," but apples are far from in season on Independence Day. 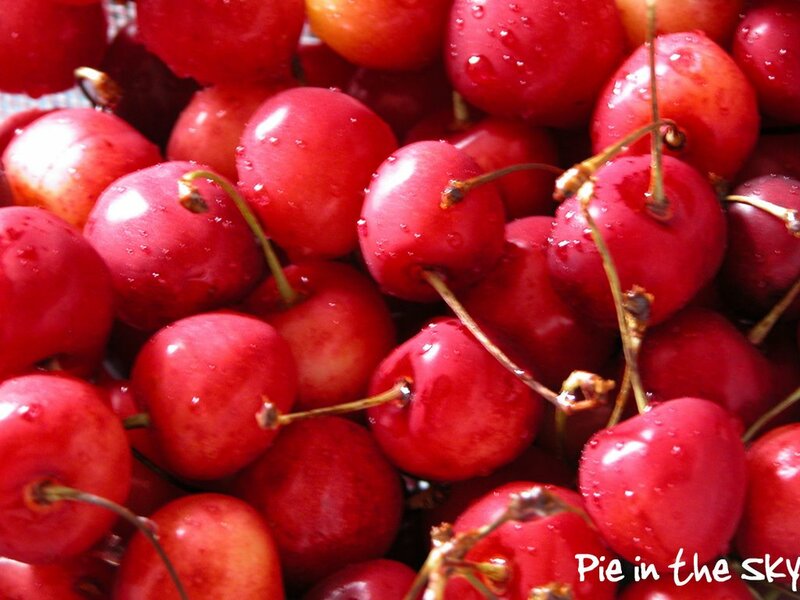 The fruits ripe for pie on the fourth of July are cherries, blueberries, and peaches. This fourth, we had a small grilling get-together on the rooftop of my teensy Manhattan apartment. I definitely traded square footage for location, roof access, and a great view when I rented this place - my building overlooks the treetops in Tompkins Square and out onto the midtown skyline. Both the Midtown and Seaport fireworks displays are viewable from the roof; we grilled everything from tofu to sirloin and listened to the booming explosions ricochet off the skyscrapers. After fireworks, we tramped downstairs for a cold, sweet bowl of vanilla ice cream and a slice of red, white and blue Cherry-Blueberry Pie. 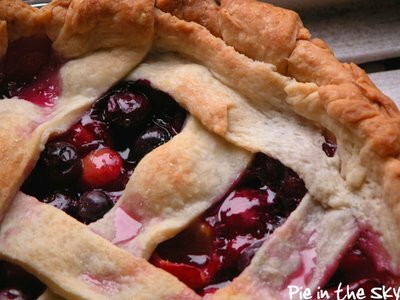 This pie is filled with an assortment of tart red cherries and sweet golden cherries, plus a big handful of the juicy blueberries that have just come into full fruit here in New York. I made the crust with butter, rather than shortening, which made it a little harder to maneuver but was worth the tender, flaky crunch. I made a butter crust using this recipe, which has very specific directions for crust-making and latticing; my only caution would be that I made the quantity of dough the recipe calls for in a 2-crust 9-inch pie for my lattice, and it was still not quite enough. 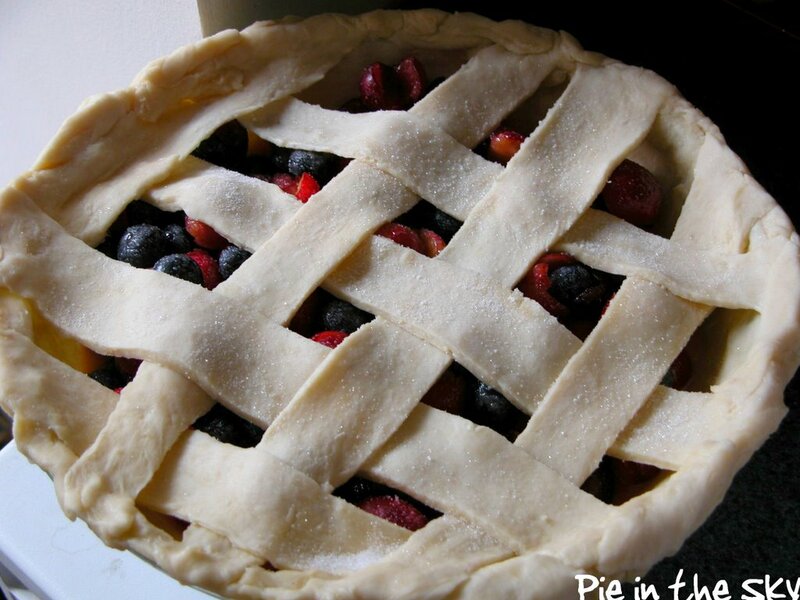 If you're going to make a lattice, I advise you to make the full two-crust amount, just in case. I also added about 2 tablespoons of sugar to the dough, which gave it a sweet, crispy flake. Combine fruit, lemon juice, zest, and sugar; stir in cornstarch and let stand while rolling out crust. Pour filling into bottom crust and lay lattice over top. Brush lattice with egg white and sprinkle with sugar. Bake pie at 400 degrees on top rack of oven for 20 minutes (put a heavy baking sheet on the lower rack for more even baking). After 20 minutes, tent edge of crust with foil collar to prevent further browning and bake for an additional 20-30 minutes, or until lattice is golden. Cool for about an hour to allow the liquid to set; serve warm with ice cream. 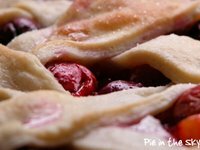 This was my first bash at homemade lattice crust, and though it had its trials and tribulations (try rolling out chilled dough on hot kitchen counters in the summer with no air conditioning! ), the end result was definitely worth it. I appreciated the explicit directions in the recipe (from The Pie and Pastry Bible), which protected me from the usual errors of overkneading or adding too much water. The recipe, which has a split-butter strategy where you cut in about two thirds of the butter and then toss in the other third in big chunks, explains that this keeps the flour from absorbing too much water and creating gluten, which causes the crust to be chewy and elastic. The bigger bits of butter are rolled out into flakes, which add dimension and texture to the crust. All the fresh fruit made the pie very juicy - perhaps a little too much so - but everyone gave it rave reviews, and it was the perfectly sweet end to an evening of fire and festivities. That pie looks awesome. Very fresh and juicy. And congrats on the lattice - I'm still intimidated by it. Thank you for taking interest in my recipes! I'm so glad they worked out for you. Looks great! This pie makes me want to weep. It's beautiful. And I'm so sad that I couldn't have a piece! Oh wow, that's made my mouth water - it looks wonderful. And it's particularly enticing to me as I've just started a blog called A Slice Of Cherry Pie !! !